The internet has made it so anyone with a big idea and a little motivation can start their own online business. This has led to an explosion of blogs, online stores, and services. This is great news for entrepreneurs or people just starting out, but it also causes a problem. When everyone is selling something, how can you stand out from the competition? For awhile I thought Lunchwalla which we featured not so long ago was related to Gowalla. So, It was quite surprising to know that the site which lets you organize everyday social events like breakfast, lunch, dinner, movies and more has integrated with Foursquare. So this means that aside from voting in on what to do, you can now check-in when you get to the events you helped organized. If you’re a regular Foursquare user and have also used Lunchwalla before, this integration would complement each other now. Meaning, all the check-ins you make on the events you organized or helped organized through Lunchwalla will be counted to your quest for mayorship of the place where the event was held. This is in addition to the fact that your check-in appears on your Foursquare profile which you can also display as an update to your Facebook profile. It’s like hitting three social networking sites with one check-in. Best of all, if you’ve got hooked into Lunchwalla since we’ve featured it on this blog, you must be earning Lunchwalla points right now. Â Of course, you still remember that those Lunchwalla points can earn you some schwags from participating merchants, right? And while we’re at it, the Foursquare – Lunchwalla integration also lets you import your Foursquare friends into your Lunchwalla contacts list. So, planning events and coordinating them with your friends is now easier. Incidentally, Lunchwalla is holding a gig right now which might earn you free tickets to see Iron Man 2. So, if you haven’t checked Lunchwalla yet, this gig might entice you to start using Lunchwalla. Frankly, the first thing that came into my mind when I stumbled upon new social media site Lunchwall was the location-aware social media site Gowalla. Not only does these two services’ names sound alike but somehow they offer similar services. Gowalla is a social recommendation site of sorts, built upon crowd sourced experience when visiting restaurants and other places of interest. Lunchwalla on the other hand is also banking on the social aspect, this time of planning gigs and events by group of people or network of friends. Basically, Lunchwalla answers the most pressing daily question – “What’s for lunch?” Â The site is for coordinating events at millions of eating and drinking establishments with friends, colleagues and family. Don’t get me wrong here, you can also use Lunchwalla for organizing breakfast, dinner, drinks and other gatherings. It is not just limited to lunch events. 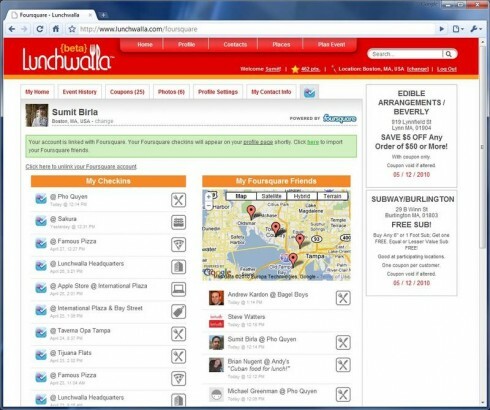 From the official press release – Lunchwalla changes social planning by combining reviews, reservations, menus and local coupons into one site that lets friends, colleagues and family vote on where to go. Â It aims to cut down cost on sending text messages the hazzle of calling back-and-forth just to finalize on where your friends would be holding your next small gathering. To find out whether Lunchwalla suits your needs, you can check out the site at http://lunchwalla.com and register to join. You can create a new account or use your Facebook login credential to start planning your next lunch gig. Lunchwalla is currently web-based service only. Although I’m pretty sure a mobile application is already under way.